My brother, Matthew R. Overholt, recently introduced me to this tool and I have been using it ever since. He and I are using Trello to manage a software development project. He loads updates of the software to the related card and I download it for testing. I can upload drafts of my information and record my research for him to work through as he has time. We find it immensely helpful. I like Trello so much that I have started migrating some of my To Do lists there as well. In the past I have tried many things to manage my To Do lists. First, I did not have one. OK, that failed miserably. Somewhere along the way I decided to keep my list on my Palm (remember those things). Not good. The Palm platform did not offer enough flexibility and things would sit on there and I would end up ignoring it. Next I tried an Excel spreadsheet. At first I thought this would be the solution. I could create lots of lists on different pages and notate what I was doing or had done or had to be done. Being a bit of a perfectionist, however, I would get caught up keeping the list up to date and not actually doing anything. After that I went to using yellow legal pads. Why yellow? Beats me. I just seem to be able to read them better. This way I could make a new one every week, cross things out as I go, and make notes at meetings. These legal pads were my most successful method by far. I still find that writing things down longhand is very good for me, even therapeutic (Check out my blog Ink for more of my thoughts on this.). After quite a while I began experimenting with Evernote. Thanks to Michael Hyatt I have really gotten into this flexible platform of keeping notes. While I am driving on the road I can speak notes to myself, sing a new lyric idea, record a few new lines to a poem, or any number of things, and the information is immediately synced with the web and my computer. I can do no better than Michael Hyatt in describing the use of this tool, so check out his blogs on Evernote. For me, however, I like to be able to use bullets and other formatting tools when dealing with To Do lists, and these things do not sync well from computer to iPhone, which frustrated me immensely. Enter Trello.com. First of all, the Trello app is spectacular and perfectly mirrors what you do on your computer, which is vital for me. 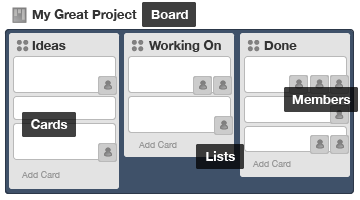 Here is a brief description: A “Board” has a set of lists on it, defaulting to “To Do,” “Doing,” and “Done.” You can add as many Lists as you want and rename them as well. On one Board I have added a List called “Resources” where I am keeping information that I access regularly. On each List you can place as many “Cards” as you wish. Each Card is a task within the List. For my church job I have a “Choose March Pianists” Card. On that Card I have placed a checklist for the four Sundays in the month waiting to be checked off. A handy progress bar indicates how far I am towards completing the checklist. On the Card I can add notes on my activity as I go (02/10 – Emailed X pianist about playing on March 4), and I can upload attachments easily to the Card as needed. I can also label Cards with colors to indicate urgency, and much more. The only downside I have found up to now is that I cannot go in and add an update to an individual entry on the card, which is probably my perfectionism working overtime! I imagine this is because the notes on the card are a record of progress, particularly in working with others, since this is primarily a collaboration tool. I am just beginning to use this tool, but I highly recommend it. I can easily move cards from list to list, manage the information, and not have 20 lists on my desk. Do you use Trello.com? If you do, what are your favorite features? If not, what do you use to manage your projects and To Do lists? 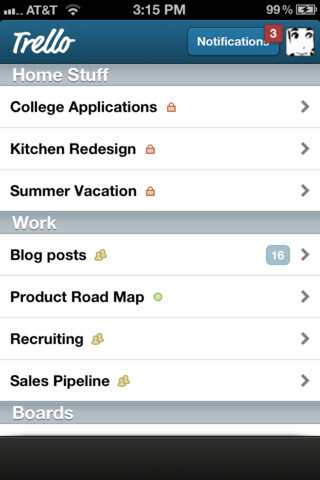 This entry was posted in Productivity, Technology and tagged collaboration, evernote, iPhone app, Matthew R. Overholt, Michael Hyatt, project management, software development, to do list, trello.com by Maurice F. Overholt. Bookmark the permalink. Editing comments on Trello is something many users have requested and they have in the que to do. I agree, that is necessary.